The Merriam Webster online dictionary defines a catalyst as “(1) a substance that causes a chemical reaction to happen more quickly, and (2) a person or event that quickly causes change or action”. At The Dance Complex, a six-studio dance cooperative and artistic space in Cambridge, Massachusetts, there are five dancemakers who – I think I’ll come to show – are both. CATALYSTS is a multi-dimensional initiative, featuring intermediate/advanced modern dance classes and works-in-progress performances from the CATALYSTS choreographers. 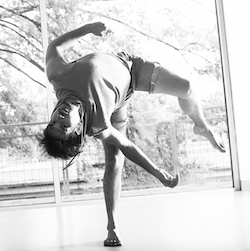 These envelope-pushing dancemakers are Chavi Bansal, Callie Chapman, Michael Figueroa, Sarah Mae Gibbons and Kat Nasti. 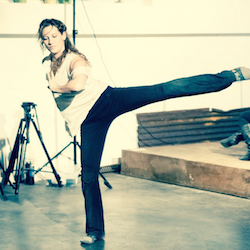 The project’s key goal is to nurture these choreographers’ voices and growing bodies of work. I spoke at length with Peter DiMuro, executive director of The Dance Complex, about the project. DiMuro initiated CATALYSTS as another tier of the dance cooperative’s choreographer support structure. The Dance Complex’s website explains that the first layer of this structure is aMaSSiT, tailored for “either those early in their choreographic ventures or for those wishing to refresh earlier choreographic studies”; the second is I-ARE, seeking to nurture “evolving choreographers and choreography within the community through peer-mentoring and lead-artist facilitation”. The Dance Complex staff accepts prospective participants into these programs by application. Thus, CATALYSTS was born. Another original layer of intention, explains DiMuro, was to create a deeper, more cohesive dialogue around these artists’ works-in-progress through showing different configurations of their pieces in multiple performances. Pre- and post-show dialogues, including collaborating artists (such as visual artists and musicians), would have the potential to further engage audience members, those already in The Dance Complex’s community and those beyond it. In an initial meeting, the five choreographers were very much on board. Furthermore, they added on another layer. They proposed teaching classes, as a way to engage the surrounding dance community in their evolving work, as well as to offer another avenue for artistic inquiry. (I dare say that any choreographer will affirm that the more chances to have moving bodies to experiment with, the better!) The Dance Complex staff and the CATALYSTS agreed that space rental fees (standard for every teacher at The Dance Complex, their pay coming from their own pre-set class fees) would be waived. All class payments would be split between the artists and a fund for the CATALYSTS January performance series. The twice-weekly intermediate/advanced modern dance classes are in full swing, which I personally have taken several times. I affirm for DiMuro that I’ve indeed seen this creative inquiry happening in the CATALYSTS classes that I’ve taken – in a very tangible, exciting way. He says that was encouraging to hear, because it can feel difficult as a teaching artist when two students show up to class – but, the next class holds 15 or more, and the creative process continues. “As an artist there are hard times, I know,” DiMuro states, “so it becomes a glass half-full, half-empty type of thing.” This project seems to be an effort at keeping it half-full more often. On that more positive side, we also discuss how it could further engage audience members in these choreographers’ performances if they might see a development of a phrase they danced in class, right there on stage before their eyes. That can contribute to the further deepening of artistic inquiry and dialogue that is a large part of the project’s mission. In addition, evidence of more widespread community engagement in dance-making can strengthen grant applications for future Dance Complex initiatives. The January CATALYSTS performance series also came right in time to help keep momentum moving forward in an often post-holiday stagnant, “blah”-feeling time. 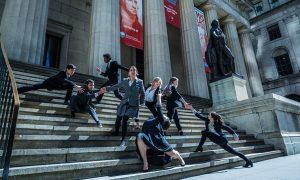 The choreographers also agreed to demonstrate the evolutions of their works in the Sunday Salons, an ongoing performance series at The Dance Complex. Further showing the choreographer’s strong connection to the dance cooperative, some of the CATALYSTS have also expressed excitement about incorporating into their work the up-and-coming seventh studio (a street-level studio with the potential to engage passersby). Others are less interested in site-based work, preferring to focus on other types of artistic exploration. In fact, DiMuro discusses how another deciding factor in choosing these particular five choreographers was how their work is all “vitally different from each other” – expanding the potential for creative exploration and dialogue. Within that difference can be strong unity, however – another reason for the project’s founding. DiMuro explains how after the economic crash and recession of 2008-2009, it became even harder for young and/or up-and-coming artists – no matter how talented, how visionary, how hard-working – to get their footing and their names out there. CATALYSTS offers a support system where “even if nobody came [to see the performances], we could still perform for each other,” DiMuro says. In another financial and practical aspect, all box office proceeds (above and beyond The Dance Complex’s basic operating costs for the performances) will go toward the artists and their continual creative efforts. Close unity on one hand and widespread engagement on the other – it seems like somehow the CATALYSTS project is managing to help strengthen both. Much artistic work will result, but the bonds, personal and professional development, and enjoyable creative exploration that bloom along the way will be just as valuable.